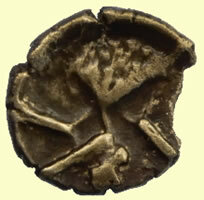 Facinating Celtic gold qtr find that appears to be a 70BC Morini boat tree type but it is not.It is underweight by 0.5g and debased gold. 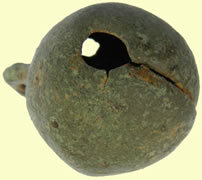 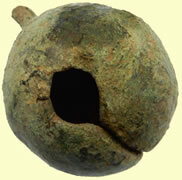 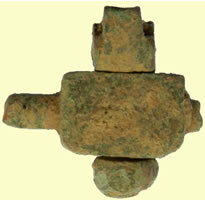 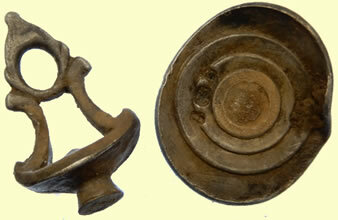 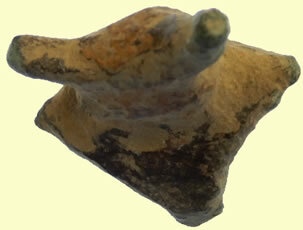 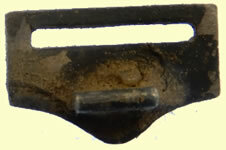 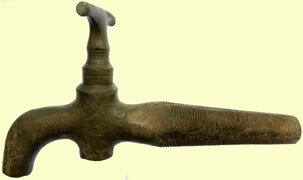 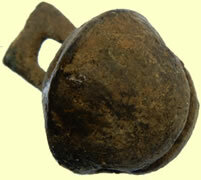 Medieval to Post-Medieval barrel tap and spigot (c. AD 1400 – c. AD 1550). Malborough & Waterloo House, Harwich Essex. 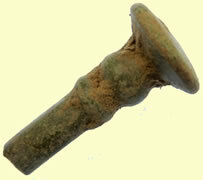 Chris, This piece is mighty scant of legend, but I can make a few reasonably safe assumptions about it. 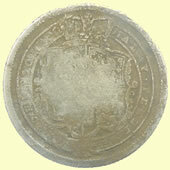 1st, your photo of the reverse is upside-down. 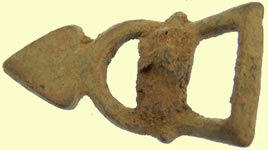 That “arch” is the doorless gateway in a so-called “campgate” centenionalis. 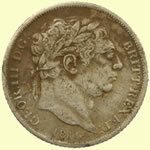 That the portrait is facing left allows me to at least guess at the date – mid-late 320’s - there having been a particular time-period during which all the Caesars’ campgate coins’ portraits were shown left-facing as opposed to those of the Augusti whose portraits faced to the right. 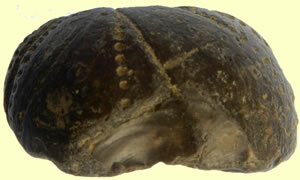 I think you can see how similar they are, also that aside from a few letters in the area off-flan on your specimen, their legends are essentially very much the same as well. 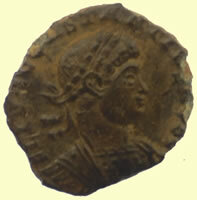 I’d have to check, but Constans may be similarly portrayed – or may not. 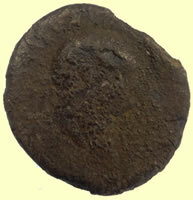 He was not created Caesar until 333 and the campgate types had been superceeded by the two soldiers and standard(s) Gloria Exercitus centenionales in 330, so probably not. The most commonly seen ruler (although not, evidently, at the time I was photographing – I’m sure I have better specimens now, but they are awaiting their eventual turn on my website) is Constantine II, Caesar, but Constantius II, Caesar is right up there in numbers as well. 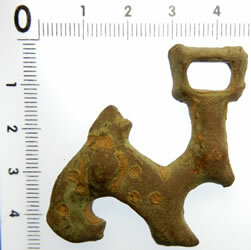 Nice find! 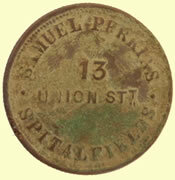 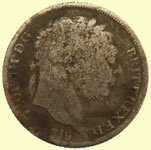 – your diggers are finding some really important and desirable Imperatorial-era coins these days which many an experienced collector would love to be able to own, but are prevented by the very high prices they command – at least they command them when their “opticals” are a bit more market-ready. 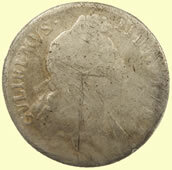 PS – I suspect the so-far “unidentifiable” denarius from a few days ago will also be from the Imperatorial era – it should be interesting to see who it is, eventually, when the obverse legend is revealed a bit. 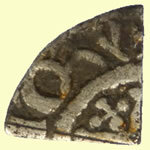 Unusual trade weight - stars and 895 inscription ?? 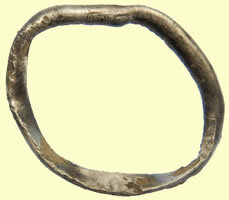 This Roman terret ring dates to circa 1st - 2nd century AD. 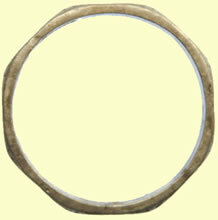 Terret rings were attached to chariots, carts or wagons and served as rein-guides. 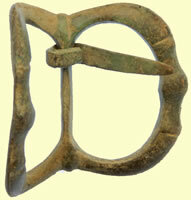 They helped guide in reins from the horses harness to the rider/charioteers hands. 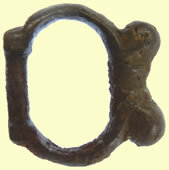 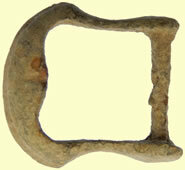 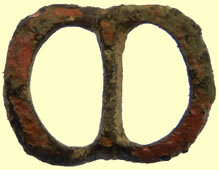 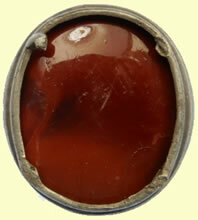 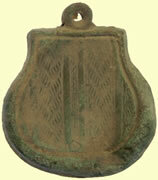 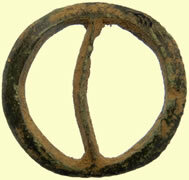 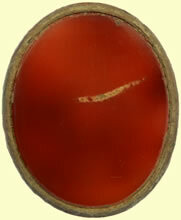 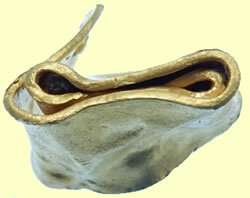 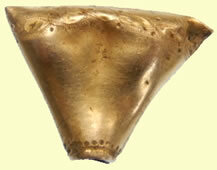 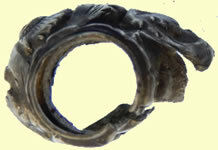 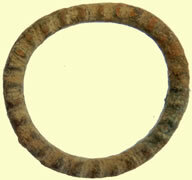 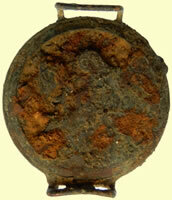 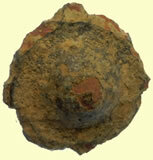 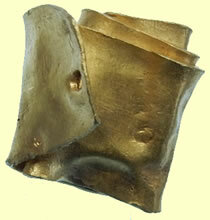 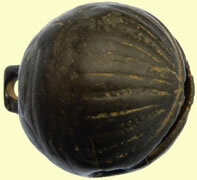 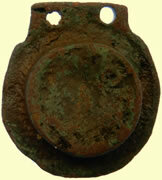 This particular type of 'skirted' terret ring dates to the Roman period (more specifically 1st - 2nd century AD). 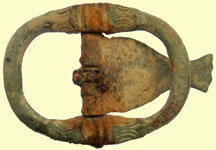 The terret would have been strapped to a wooden yoke, which is a pole fixed to the front of the cart and passed between a pair of horses. 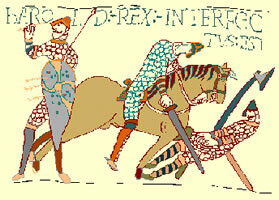 Most vehicles would have five terrets; four small side terrets (two for the reins of each horse) and one larger central terret, probably at the end of the yoke closest to the driver, through which the reins would pass. 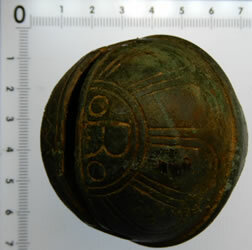 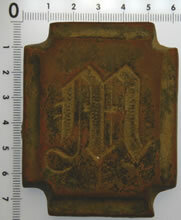 Unknown artillery badge - Not British, cannon facing right ?? 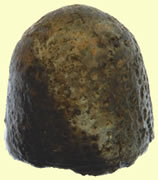 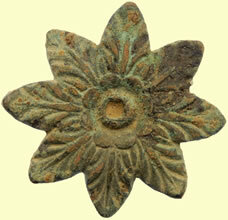 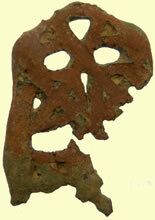 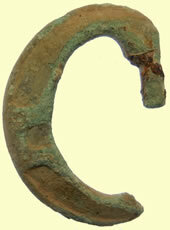 Copper-alloy cast mount. 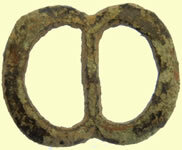 The mount is quatrefoil in shape with a cusp in each angle. 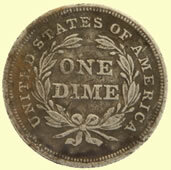 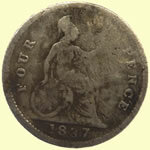 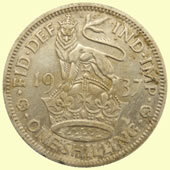 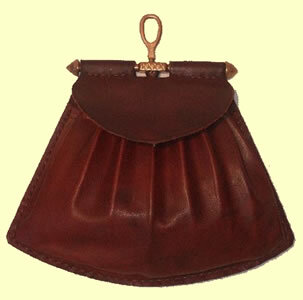 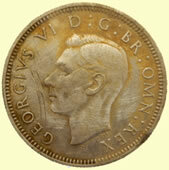 The reverse has two attachment lugs. 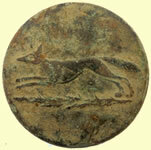 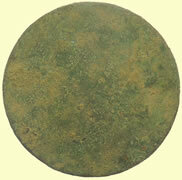 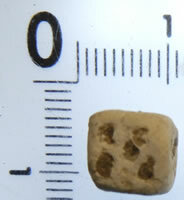 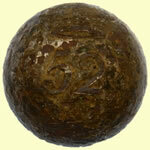 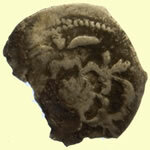 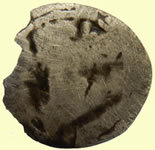 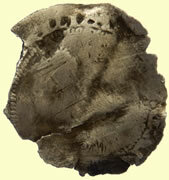 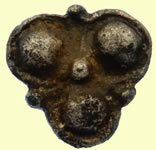 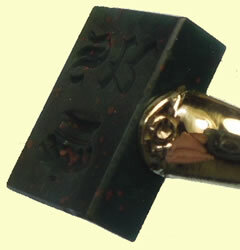 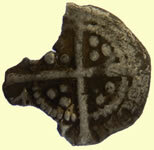 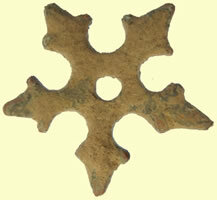 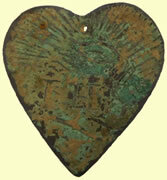 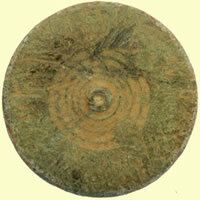 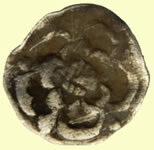 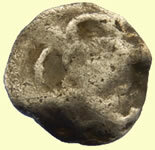 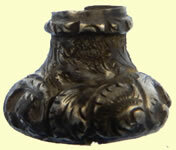 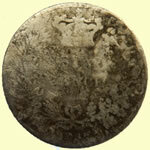 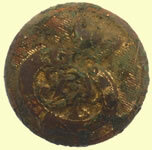 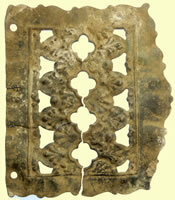 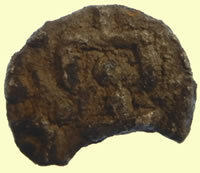 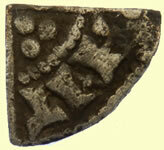 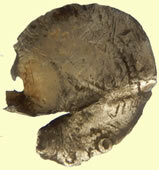 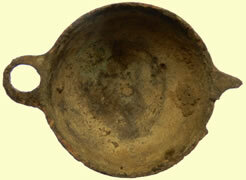 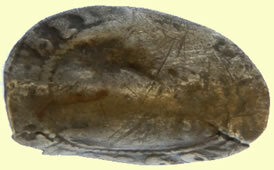 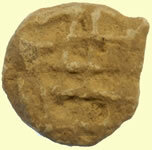 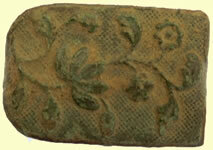 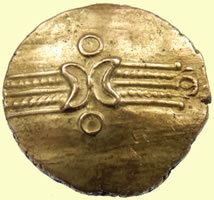 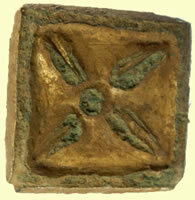 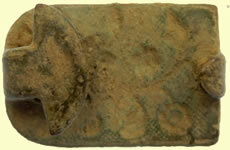 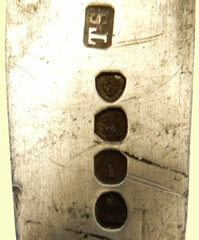 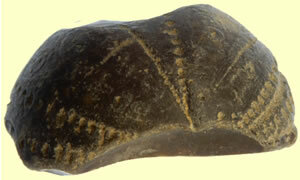 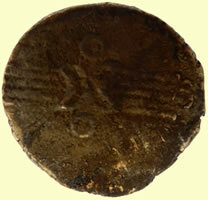 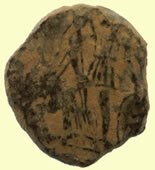 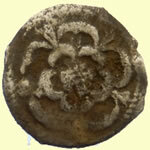 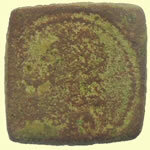 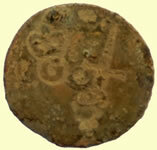 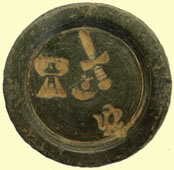 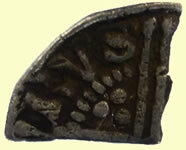 This is a superb example of the Iron Age die-engraver's art. 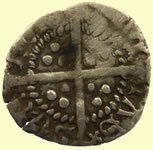 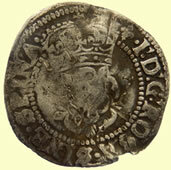 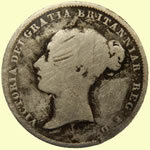 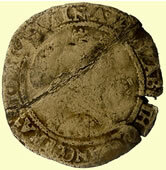 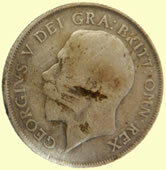 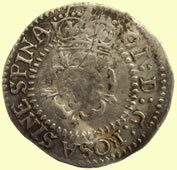 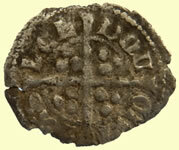 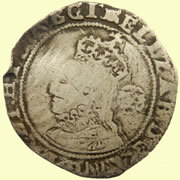 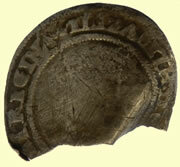 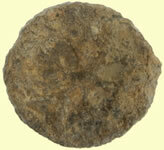 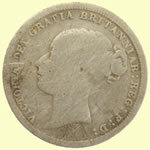 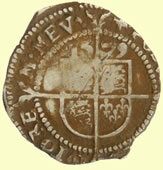 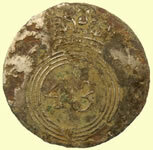 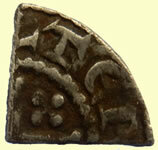 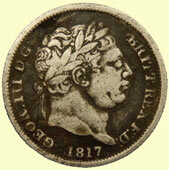 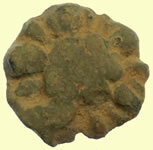 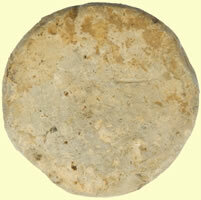 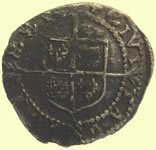 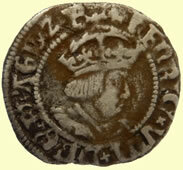 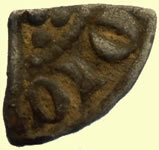 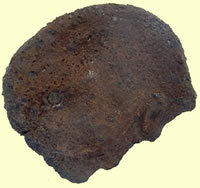 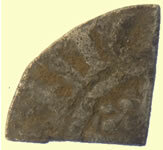 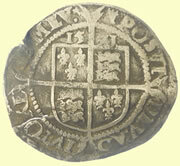 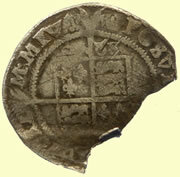 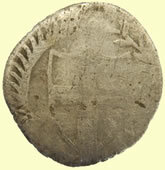 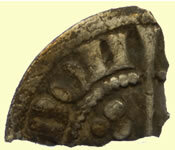 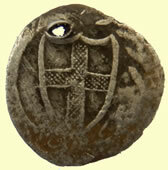 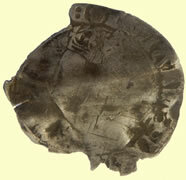 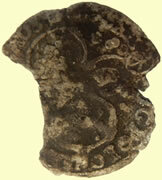 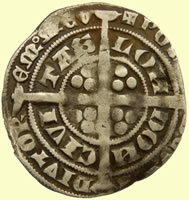 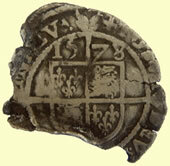 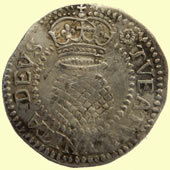 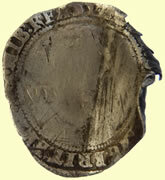 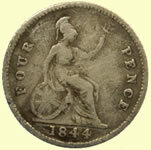 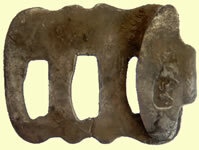 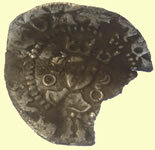 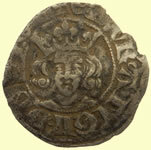 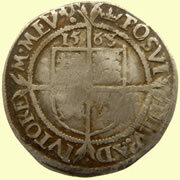 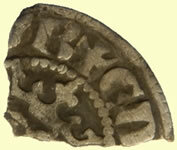 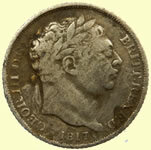 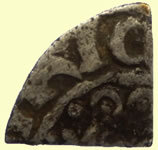 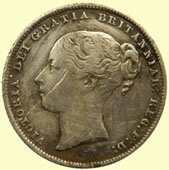 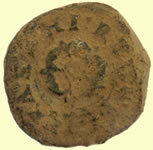 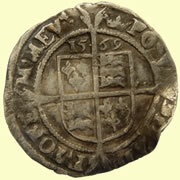 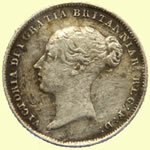 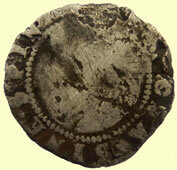 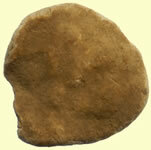 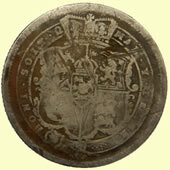 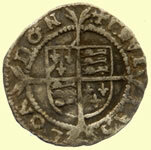 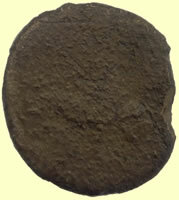 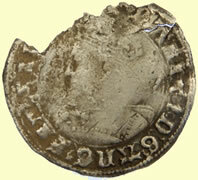 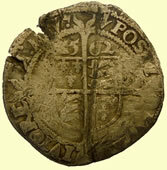 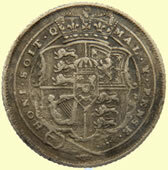 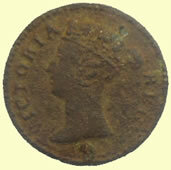 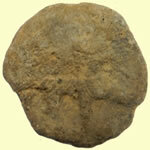 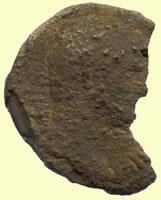 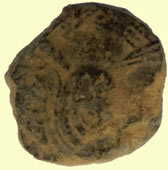 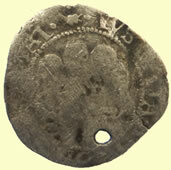 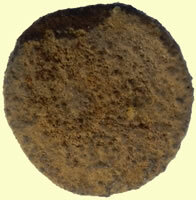 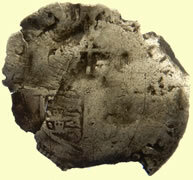 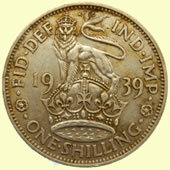 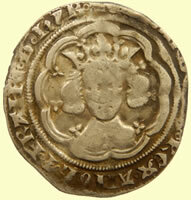 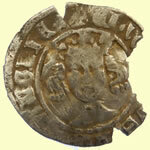 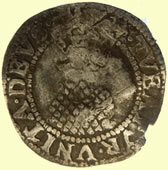 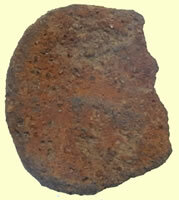 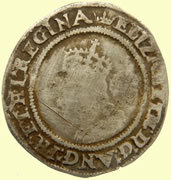 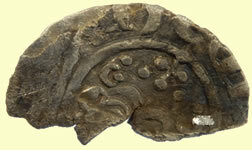 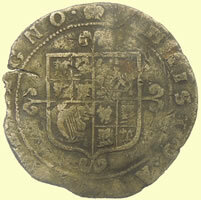 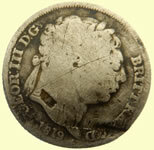 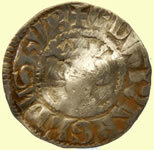 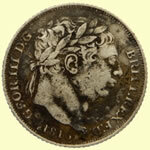 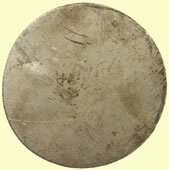 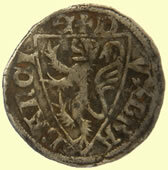 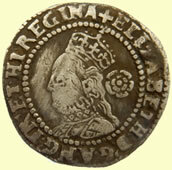 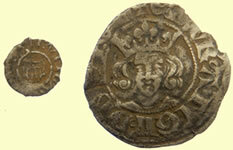 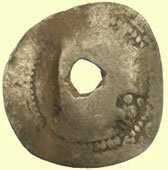 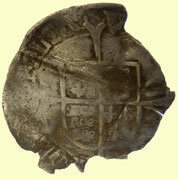 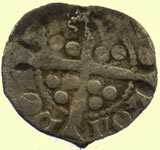 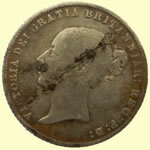 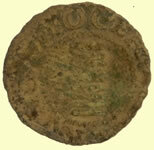 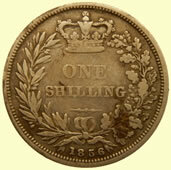 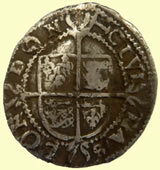 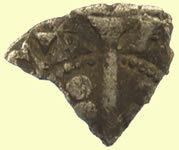 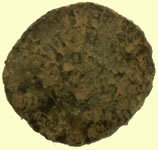 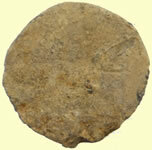 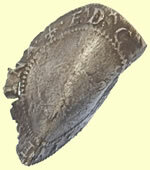 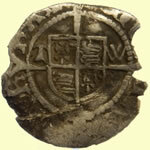 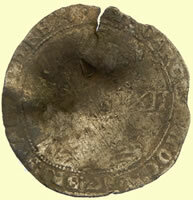 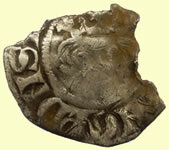 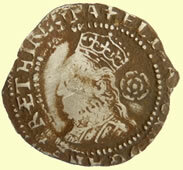 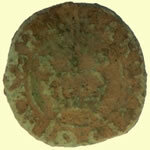 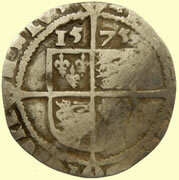 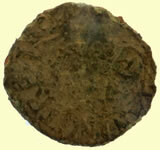 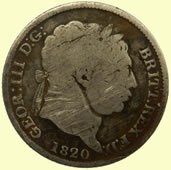 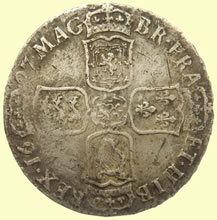 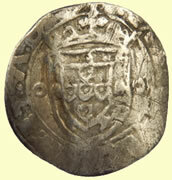 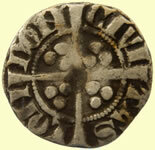 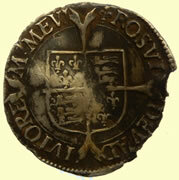 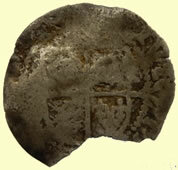 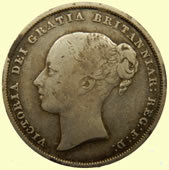 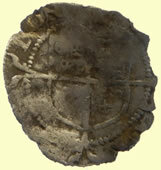 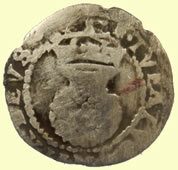 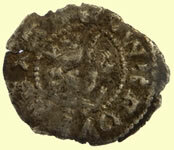 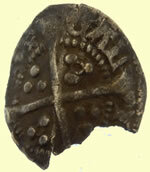 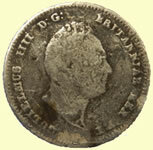 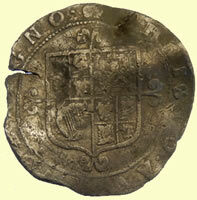 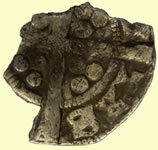 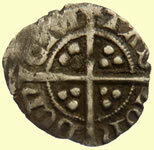 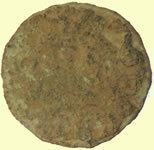 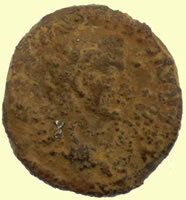 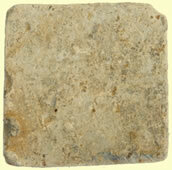 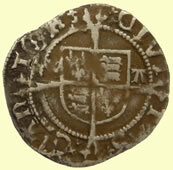 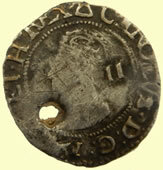 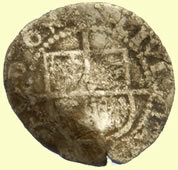 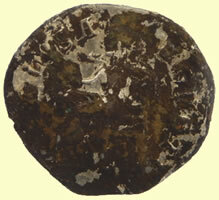 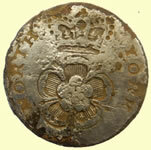 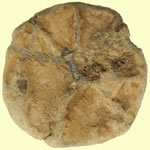 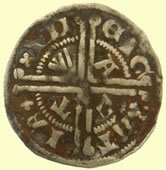 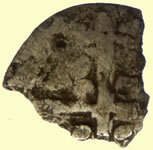 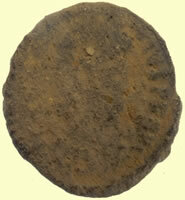 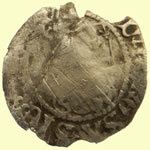 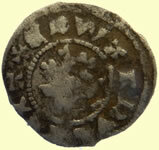 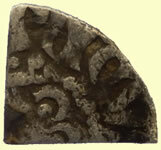 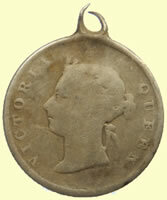 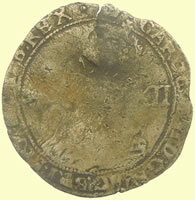 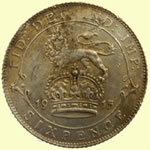 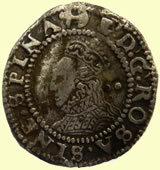 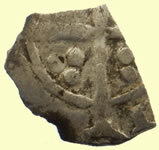 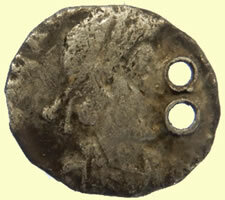 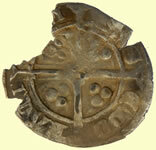 It also represents what is thought to be the first type of coin ever to circulate in Britain. 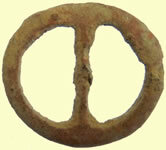 They were probably made on the Continent in northern France or Belgium. 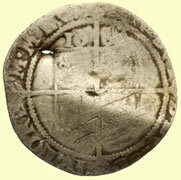 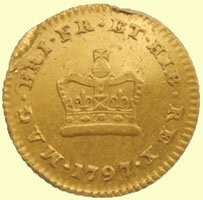 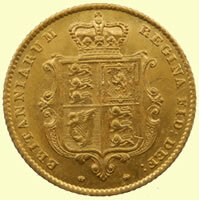 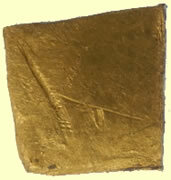 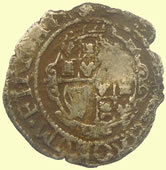 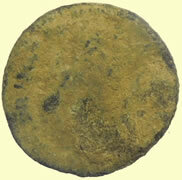 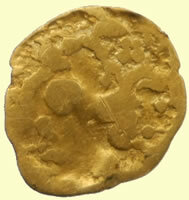 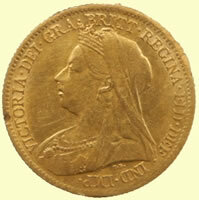 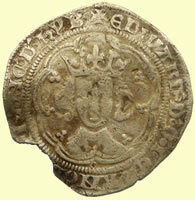 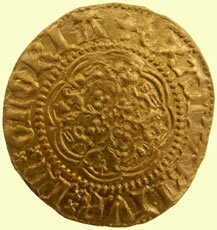 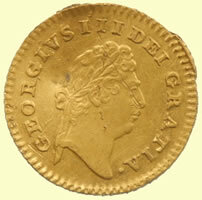 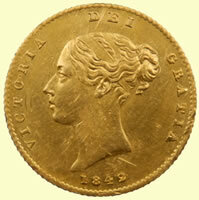 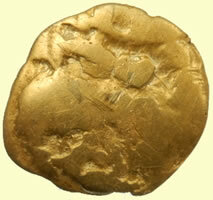 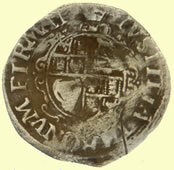 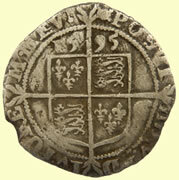 Gold coins like this crossed over the English Channel, perhaps in trade or as gifts between high-ranking individuals. 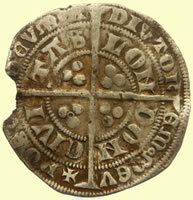 Some of them were eventually buried in coin hoards and not recovered by their owners. 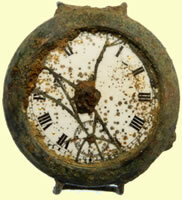 The owner may have died, or simply forgotten where they had put them. 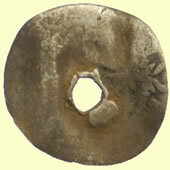 Alternatively, the coins may have been intended as permanent, sacred offerings to the gods. 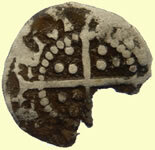 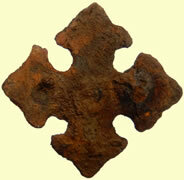 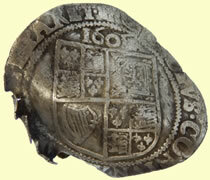 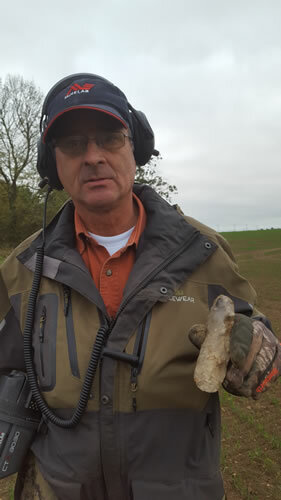 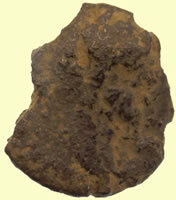 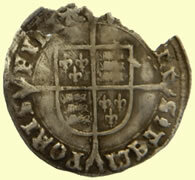 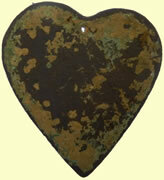 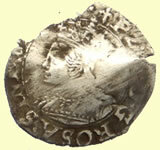 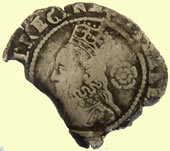 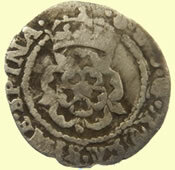 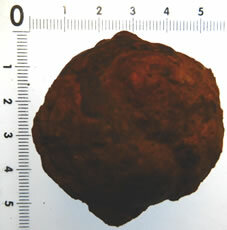 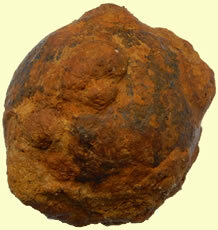 They are mostly found today by metal-detectorists, in locations throughout south-east England. 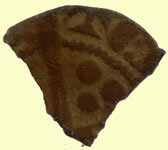 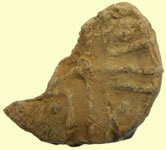 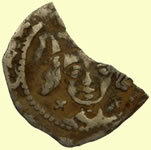 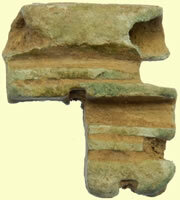 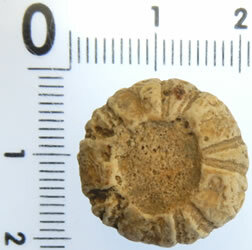 Another one was found at Fenny Stratford near Milton Keynes. 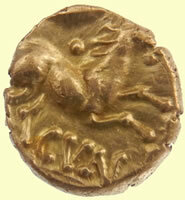 The design of the coin is, at several stages removed, descended from the Greek gold staters of King Philip II of Macedon (reigned 359-336 BC). 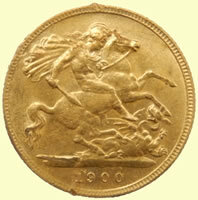 The hair on the left-facing head has grown considerably, while the original two-horsed chariot on the reverse of the coin has been transformed here into a lively, abstract depiction of a horse surrounded by a large array of symbols. 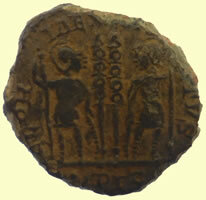 The fairly clear, but edge-chipped centenionalis has Constantius II as Caesar (324-337 AD) on the obverse “FL IVL CONSTANTIVS NOB C” and as I’m sure you know, the two soldiers flanking one or two standards on the reverse will have GLORIA EXERCITVS for the legend. 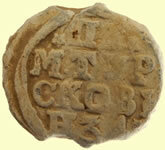 There are two standards, so it dates to the earlier part of the huge emission for the dedication of the new capital at Constantinople, 330-335 AD. 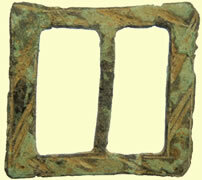 In 336 AD, the number of standards was reduced from two to one when the weight of the centenionalis underwent a downward adjustment. 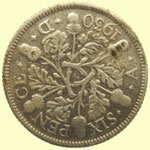 I’m not quite certain what the mint mark is on this one, either. 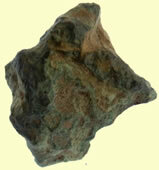 What I see doesn’t tend to make much sense, so what is visible must not be exactly what’s there. 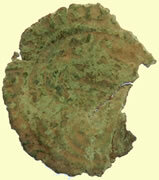 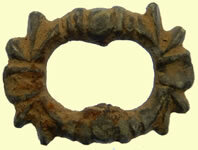 One possibility is an open-topped (“U” shaped) wreath preceding PLG which would indicate Lugdunum or modern-day Lyons. 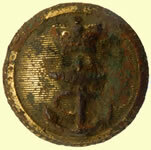 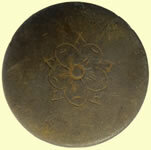 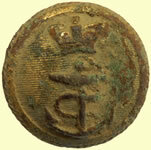 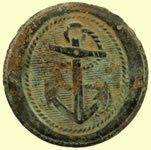 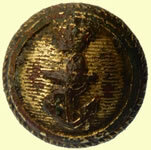 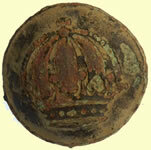 18thC Royal Navy button Army button ? 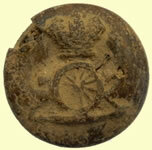 Army button ? 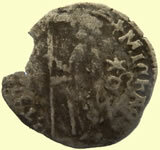 I told you I’d get back to you on this one – so far as I can determine from the very few legible letters, this is a siliqua of Gratian, 367-383 AD, the obverse legend should be [D N] GRATIA[NVS P F AVG]. 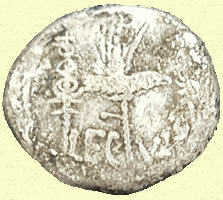 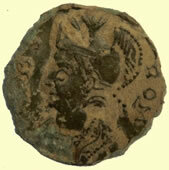 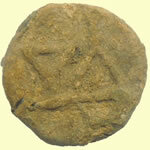 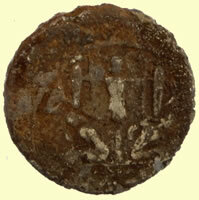 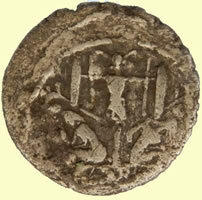 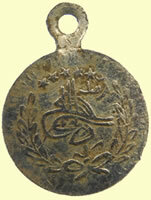 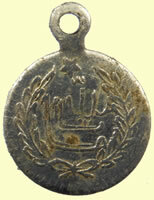 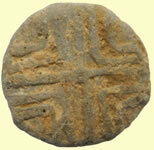 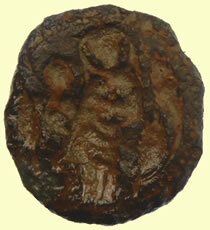 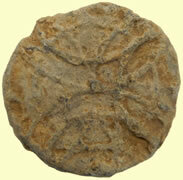 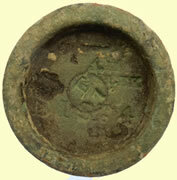 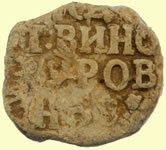 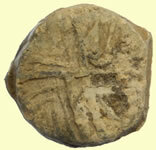 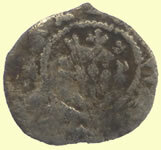 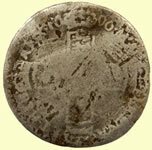 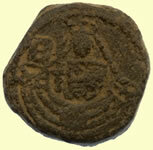 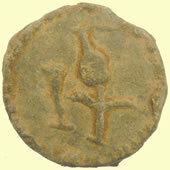 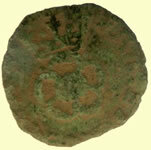 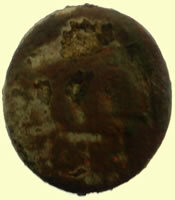 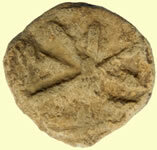 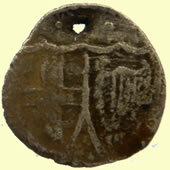 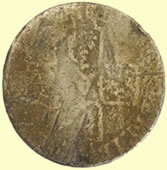 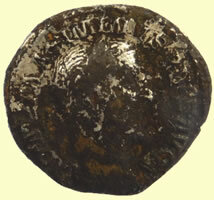 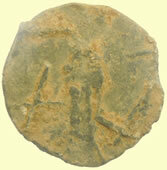 The reverse type is VRBS ROMA with Roma enthroned left holding Victory. 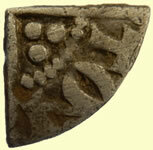 The mint mark is fairly unclear, but I think it may be AQP[S] for the mint at Aquilea. 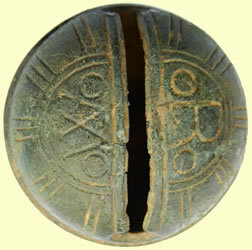 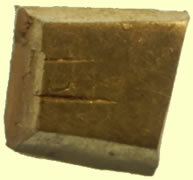 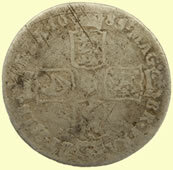 Having two holes would tend to indicate that this piece needed to be “fixed” in its position, but the orientation of neither the obverse nor reverse seems to have been of importance. 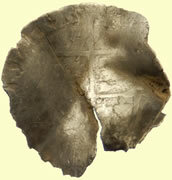 The holes are pretty large and silver coins were used a lot less often for this, but coins so holed could be sewn to a leather jerkin for a bit of DIY “scale” armor. 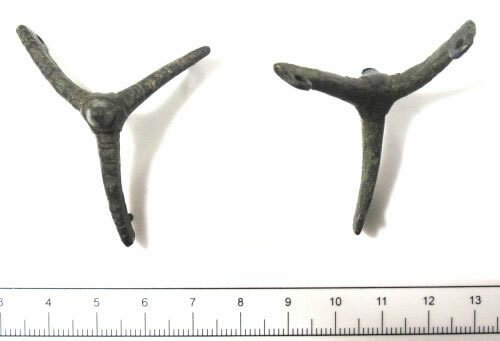 Or perhaps it was part of a bit of jewelry of some sort which needed to attach at two points as part of a necklace or bracelet. 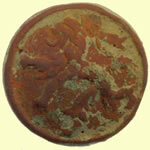 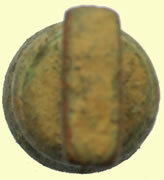 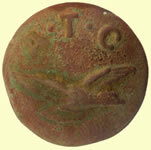 19thC livery button Interesting token - not sure what it is ?? 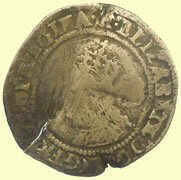 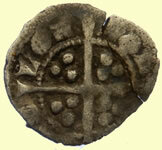 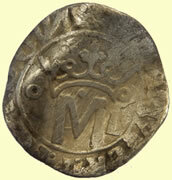 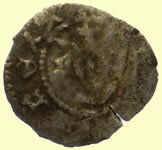 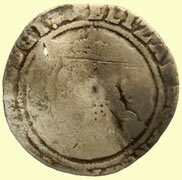 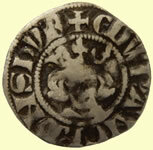 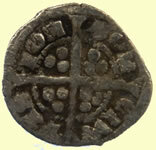 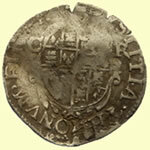 Doge Michele Steno (1400-1413) Venetian soldino silver coin . 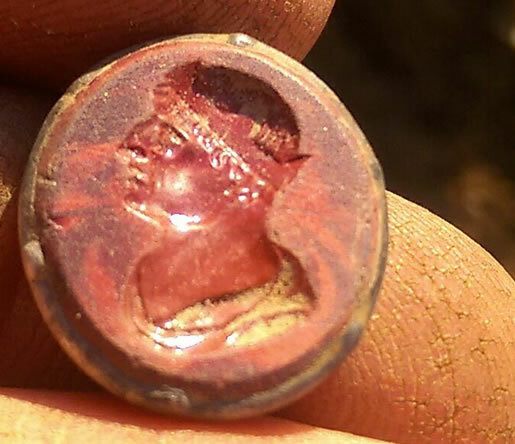 I’m going to need to see this one as it progresses, but on the basis of the family resemblance of the portrait and the fact that the obverse legend appears to be counter-clockwise, it seems very likely to be one of the earlier Julio-Claudians – Julius through Claudius. Send me photos when it’s been cleaned a bit, and I can probably tell you a lot more when the “reverse” becomes legible and/or the portrait on the reverse is clearer and more recognizable . 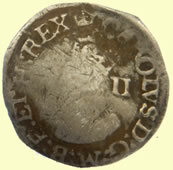 I can’t be 100% certain on the basis of so little, but there were very few denarius-issuing emperors who used “COS VIII (or VIIII?) 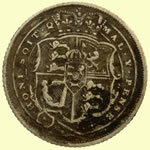 in their coin legends. 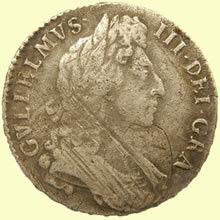 Then there’s the curly hair – too bad we can’t see if this ruler is bearded. My best guess at the moment is Antoninus Pius (139-161) he had curly hair, a long straight nose, and was portrayed that way. 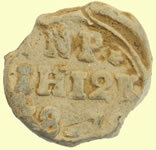 He also used his consulship numbers through VIII and VIIII (not sure if this fragment is the very end of a legend, or whether it might have the tag-end of P.P. 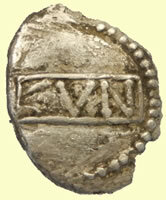 – or even be one of the few in which the consulship number is in the middle rather than at the end of the reverse legend on a denarius. 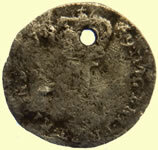 The other possibility would be any of the Flavians (Vespasian, Titus and Domitian, 69-96) all of whom had 8th consulships (Domitian had a 9th noted on coins) and said so on denarii. 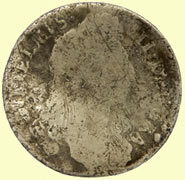 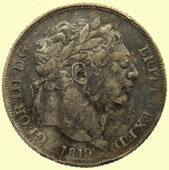 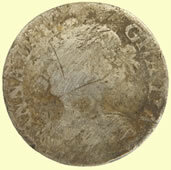 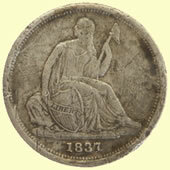 One problem I have with the Flavians is many of their obverse legends were counter-clockwise while the legend on the fragment appears to be clockwise. 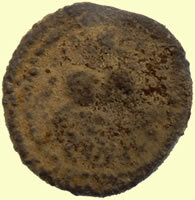 If you’re going to cook this, send me an “after” photo and I’ll see if the currently mainly illegible obverse legend fragment can be found in the legends of any of the possible denarii of the aforementioned emperors. 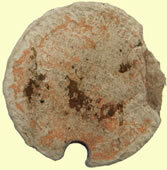 Or, that reverse might be copied from a fallen horseman FEL TEMP REPARATIO reduced majorina from the 350’s – however, what looks like a discarded shield in the lower right quadrant seems to be the edge of a flan-chip. 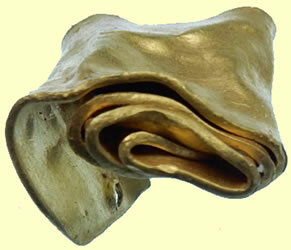 So you can see there are several possibilities for the prototype. 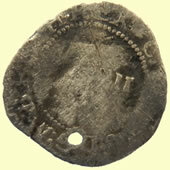 It didn't commonly happen, but contemporary copies occasionally borrowed, copied and mixed devices from more than one single coin-type. 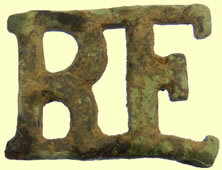 Sorry this ran so long, but it’s sort of a complex question trying to figure out what the local manufacturers had in mind with their designs/devices on the local un- or semi-official issues which became common as the Romans evacuated and left first Britain, then northern Gaul to their own devices. 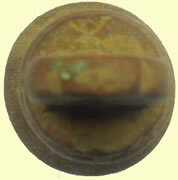 Oh boy, this one is easy – I didn’t even need to enlarge the thumbnail. 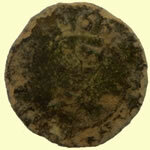 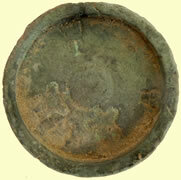 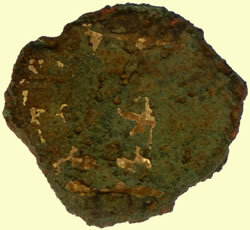 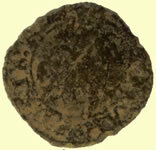 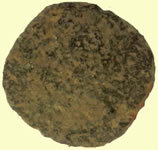 This is part of the coinage created by Marcus Antonius – Marc Antony - to pay his troops and marines. 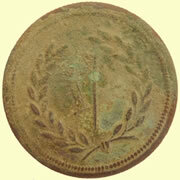 They were minted in anticipation of the battle of Actium ca 32 BC. 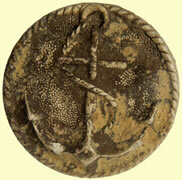 He lost the battle rather badly to a superior naval force led by Agrippa. 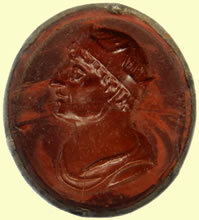 This historic upset of power paved the way for Augustus to create the Empire out of the shambles of post civil-war Republican Rome and was the primary reason for his and Cleopatra’s suicide. 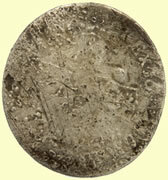 These are known as legionary denarii – they were a little less pure silver than the regular Republican denarii, so they tended to get saved out rather than turned in for re-minting in later years since they were under purity – why turn in 5 denarii and get only 4 back when they can still be spent as a full denarius in the marketplace? 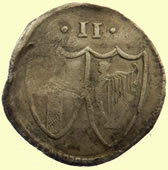 Then, some years later, the silver content began to be officially and significantly reduced in the Imperial coinage, and again, the legionary denarii still in circulation were now of too high a fineness to turn in and so were hoarded for their silver content. 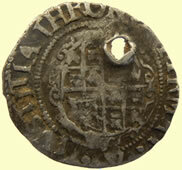 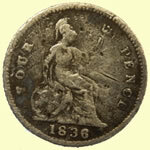 So these tended to stay in circulation for a LONG time – especially those which found their way north in trade. 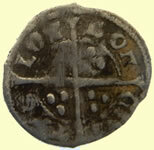 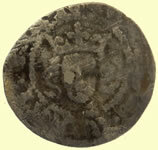 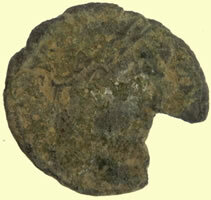 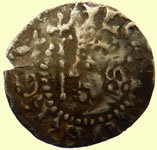 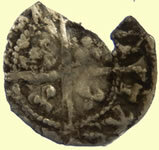 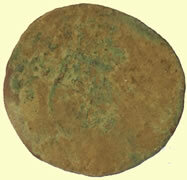 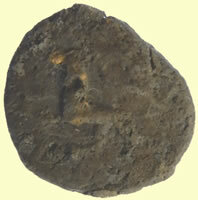 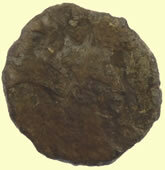 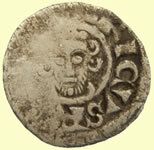 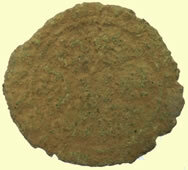 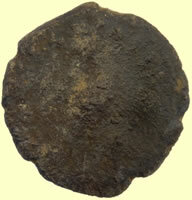 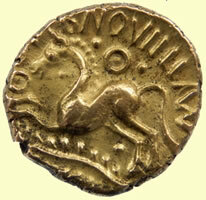 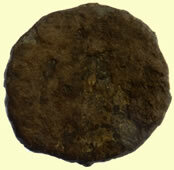 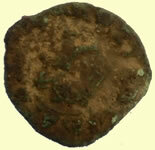 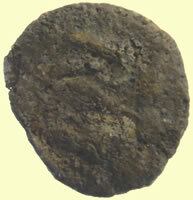 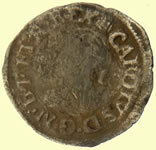 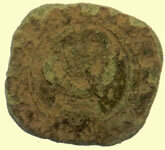 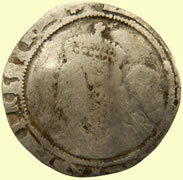 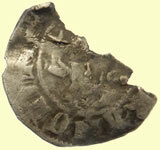 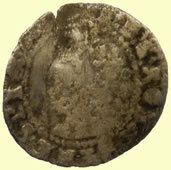 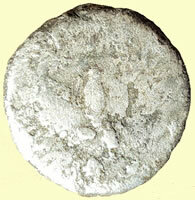 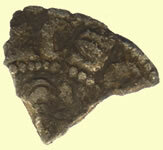 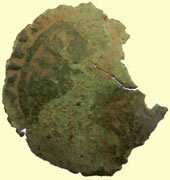 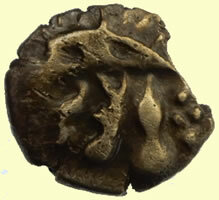 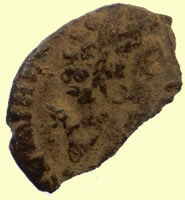 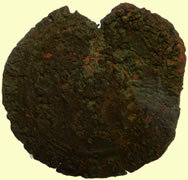 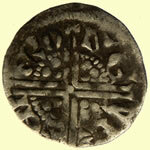 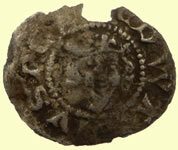 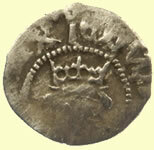 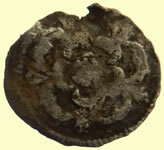 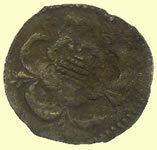 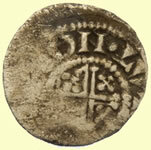 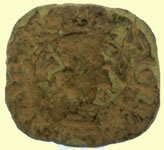 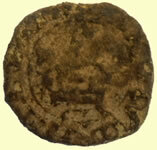 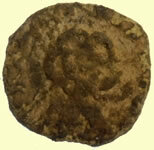 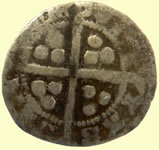 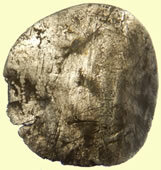 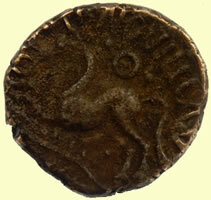 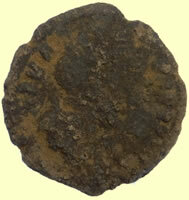 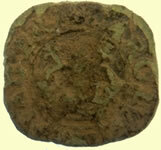 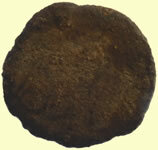 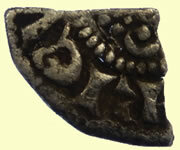 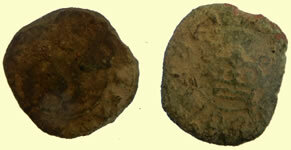 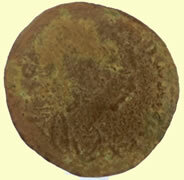 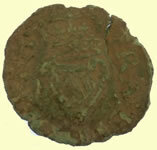 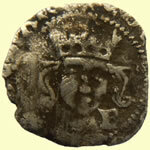 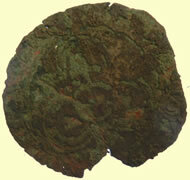 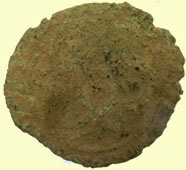 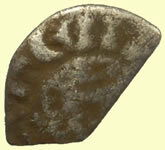 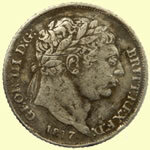 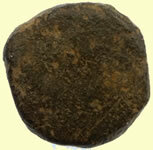 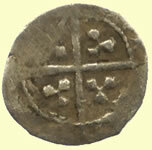 Some circulated in Gaul and Britain for up to a couple of centuries and are found in hoards of 3rd century coins. 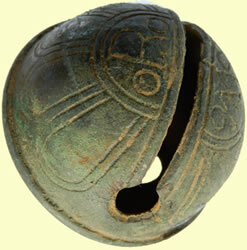 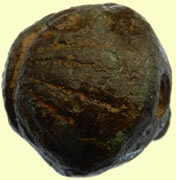 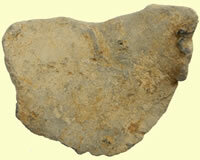 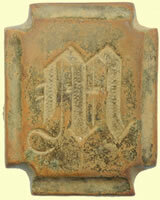 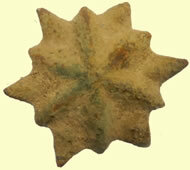 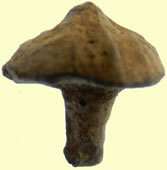 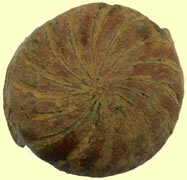 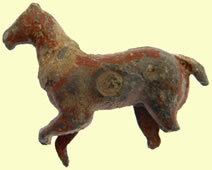 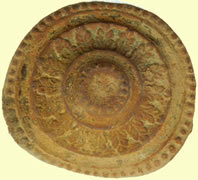 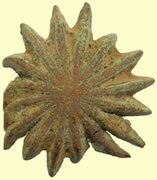 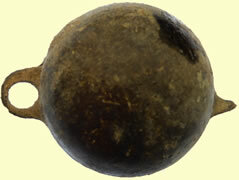 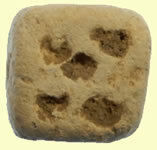 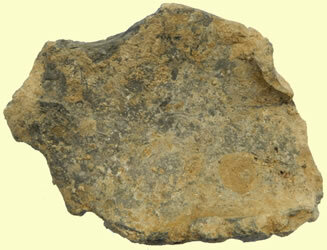 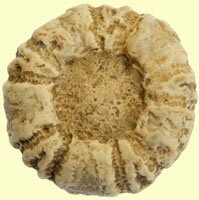 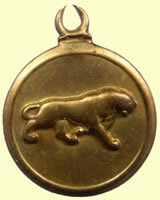 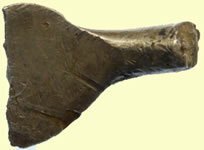 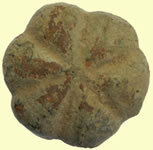 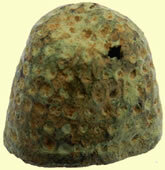 They were popular in trade in the northern provinces, So these are often found in extremely worn condition. You have the side there which names a specific legion. 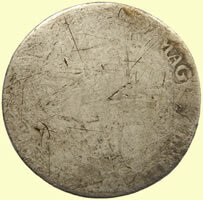 There are 20 or 25 varieties, mainly different legion numbers, overall, but some legion numbers are common and some scarce-to-rare. 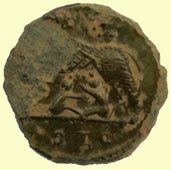 Yours appears to be legion VI (or maybe VII, it’s a bit unclear) and has an “Aquila” - the legionary eagle standard - between two vexillae. 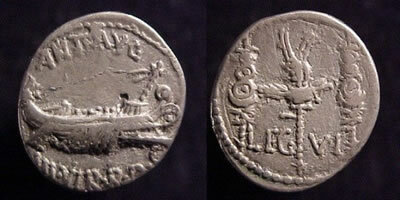 The obverse features a galley rowing with crew and names Marc Antony as Augur and various other titles he held. 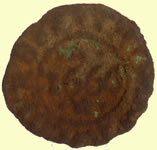 This is a similar specimen from my own collection, in a bit better shape overall. 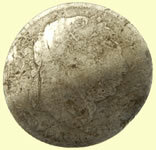 Roman Imperatorial AR denarius 16mm, 3.33gm. 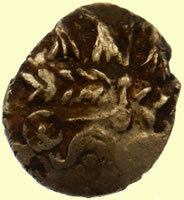 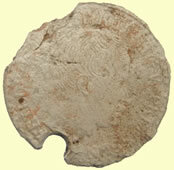 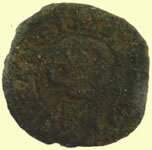 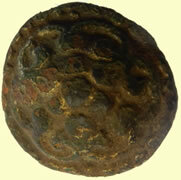 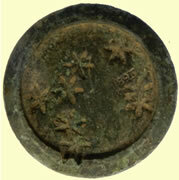 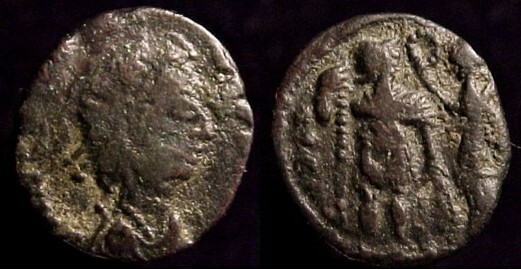 Mint in Patrae, 32-31 B.C. 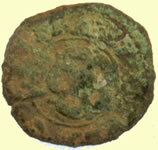 Marc Antony - Legionary issue minted prior to the battle of Actium. 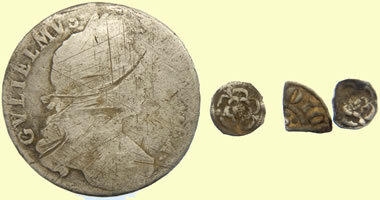 Obv: ANT AVG III VIR R P C. Galley rowing right, mast with banners at prow. 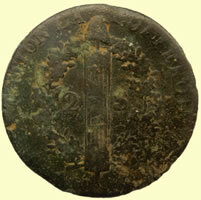 Rx: LEG - VI legionary eagle between two standards. 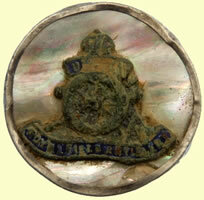 An other ranks version to the 1st RVB of uncertain date the unit served in Portsmouth, Gibraltar, Holland and Harwich where they were disbanded in 1814, reformed the following year they were disbanded in 1816 in Plymouth. 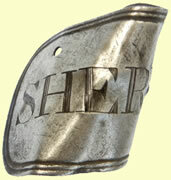 The badge was worn on the uniform immediately above the right breast pocket, i.e. 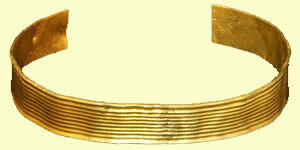 the opposite side to any medal ribbons. 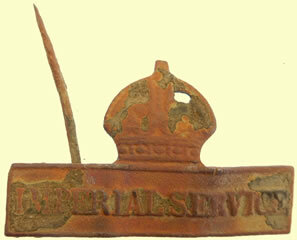 The majority of those who received the award did so for services during the First World War. 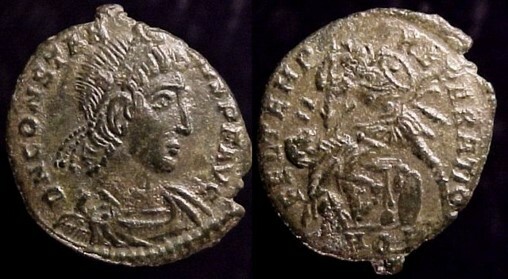 Constantius II, as Augustus, 337-361 AD. 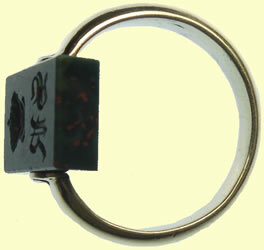 Silver silique “the vows of 30 (years)” being completed, he is swearing to “honor the new vows of 40th “anniversary. 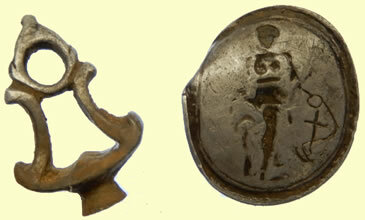 He didn’t live long enough to celebrate that 40th Vota, but he’s one of the very few emperors who were around long enough that they could have competed a vota for 30 years. 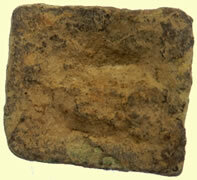 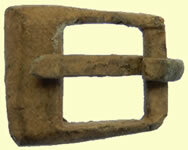 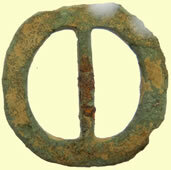 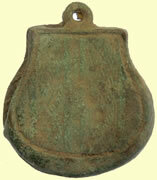 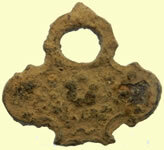 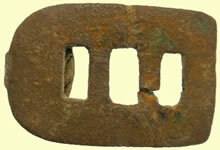 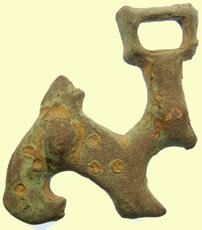 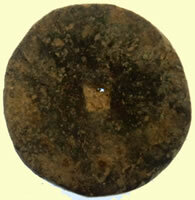 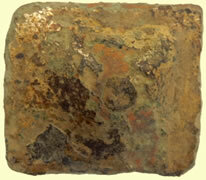 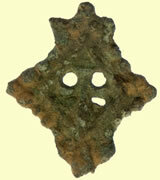 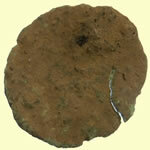 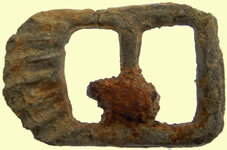 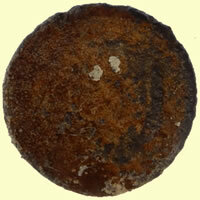 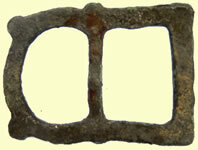 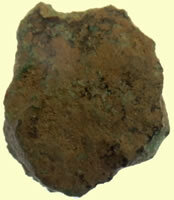 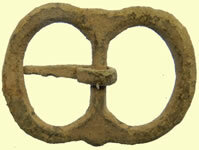 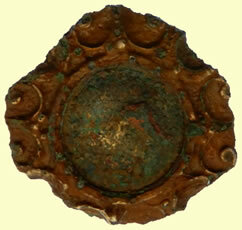 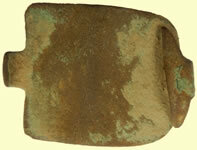 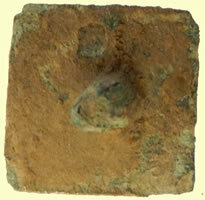 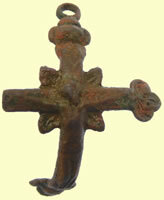 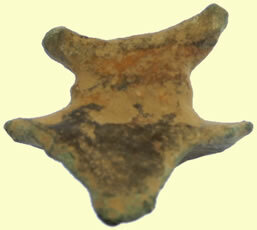 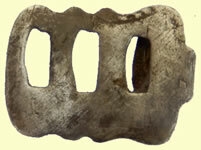 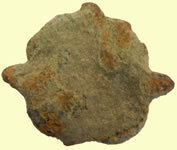 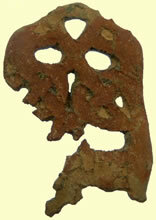 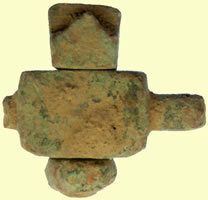 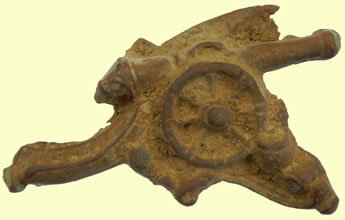 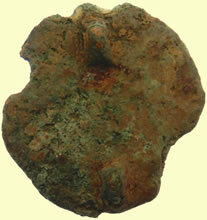 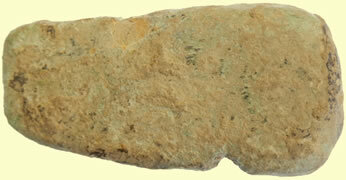 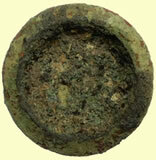 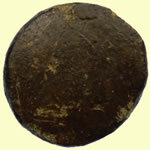 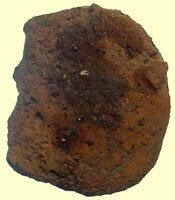 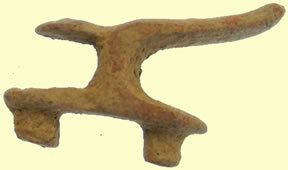 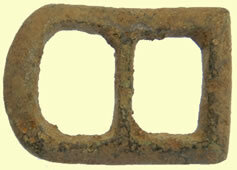 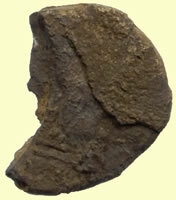 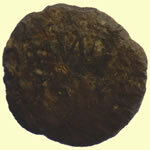 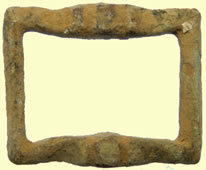 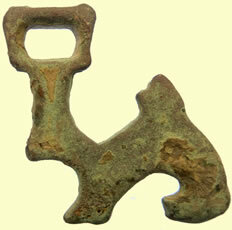 Generic merchant navy button Early medieval lead token Medieval cast copper alloy bar mount. 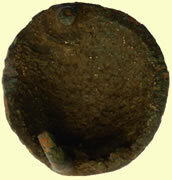 The main body is cirulcar with large central openwork hole. 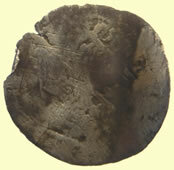 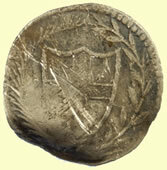 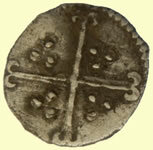 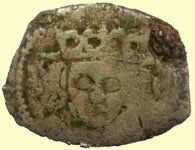 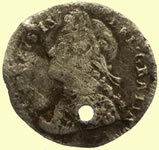 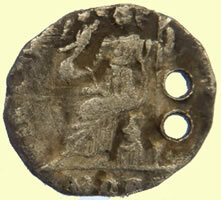 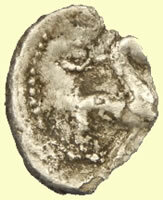 Shewolf & Twins reverse which is typically found on the VRBS ROMA, City of Rome commemorative, reduced-module folles introduced around 330 AD., at the time Constantinople became the official seat of Constantine's government. 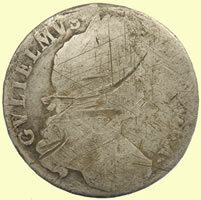 These have a helmeted and mantled bust of the allegorical personification of the City of Rome facing left on their obverses. 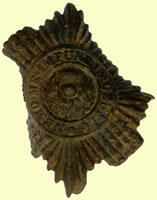 In 1763 various local battalions were amalgamated​ to form the North Riding Militia through various name changes they eventually form the 4th Battalion of the Yorkshire Regt. 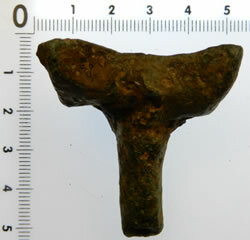 Medieval chaffing dish handle Unknown Army button ? 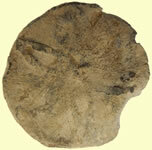 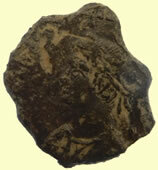 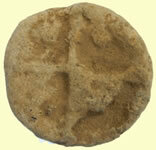 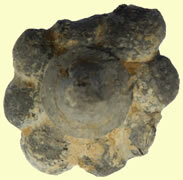 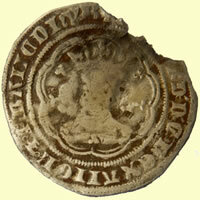 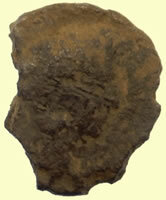 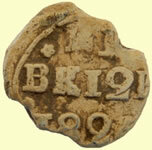 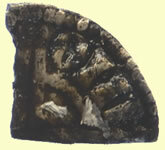 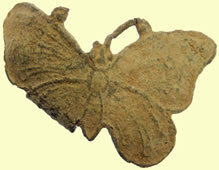 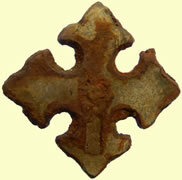 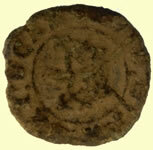 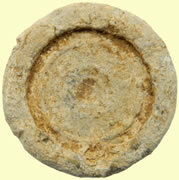 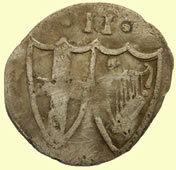 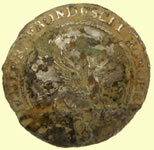 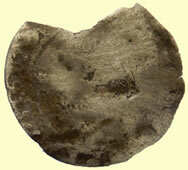 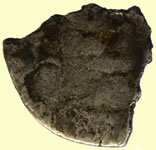 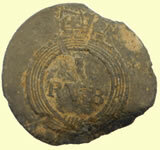 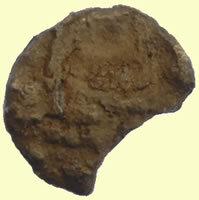 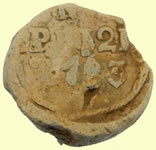 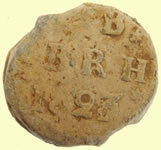 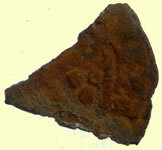 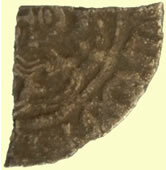 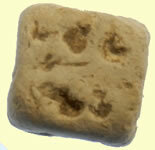 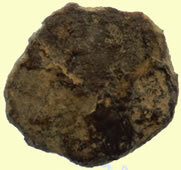 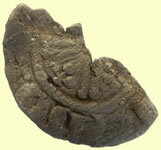 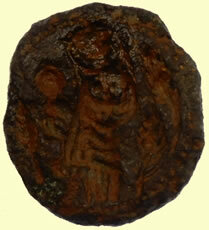 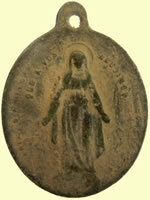 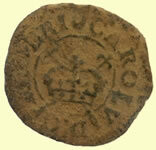 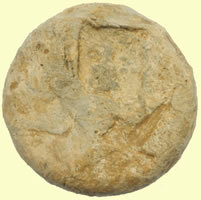 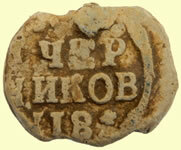 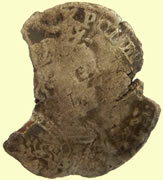 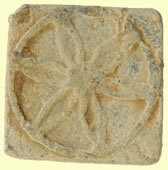 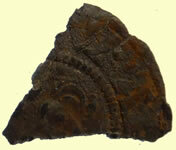 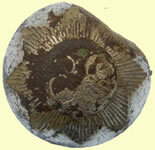 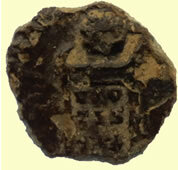 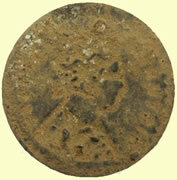 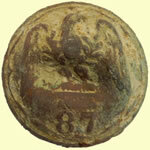 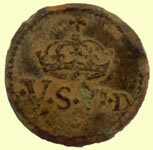 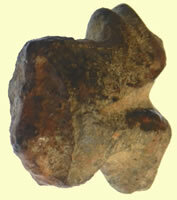 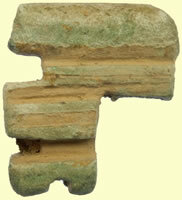 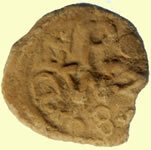 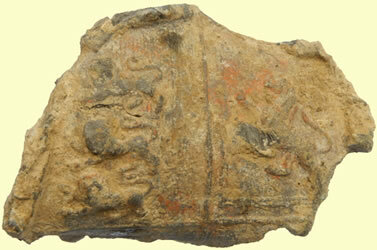 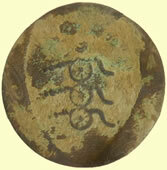 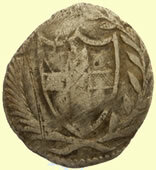 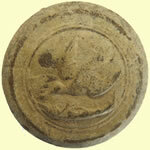 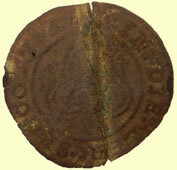 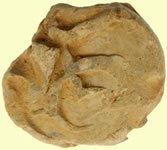 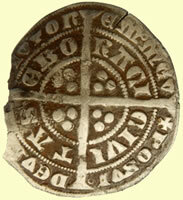 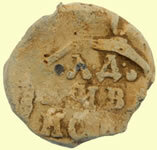 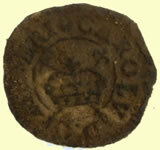 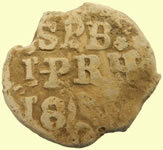 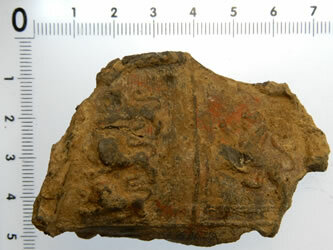 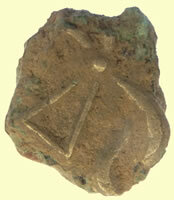 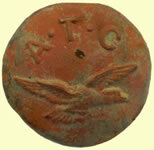 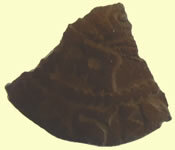 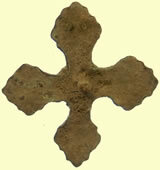 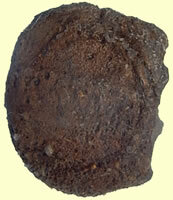 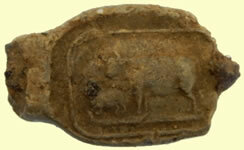 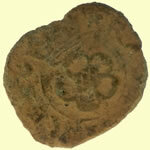 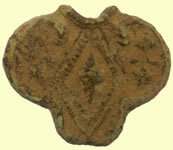 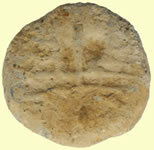 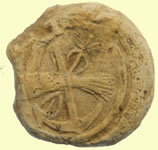 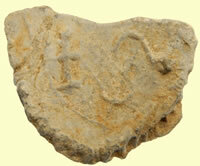 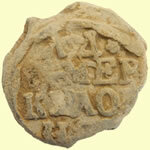 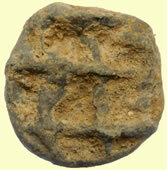 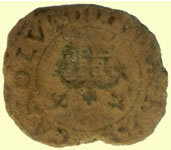 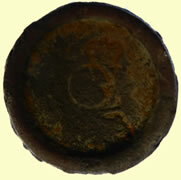 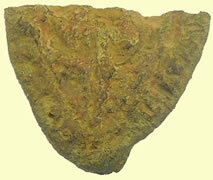 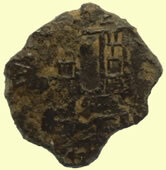 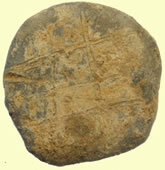 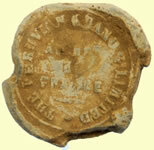 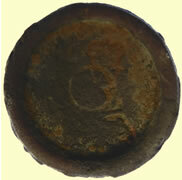 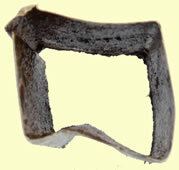 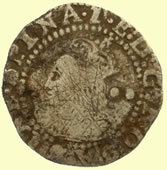 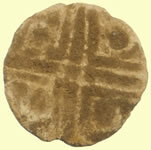 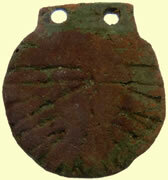 A lead seal of the 'bulla' type from a bag of Peruvian guano (fertiliser made from bird excrement). 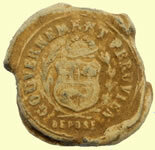 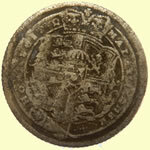 One side of the seal depicts the shield of arms of Peru. 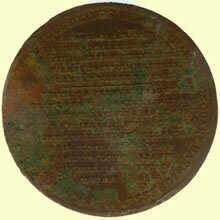 It has the inscription GOUVERNEMENT PERUVIEN around, and DEPOSE below. 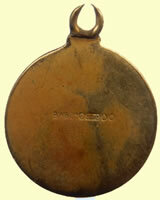 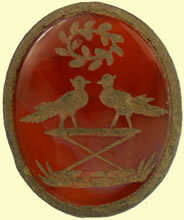 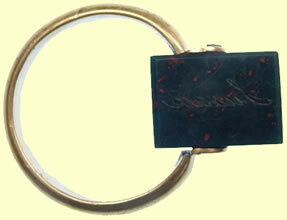 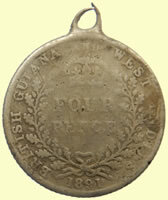 The other side is inscribed THE PERUVIAN GUANO Co LIMITED around, and AGENCE DE FRANCE in three lines in the centre. 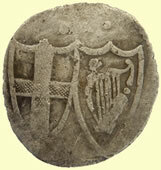 The bulla - a disc with a tunnel from side to side through which a string is passed - became a popular form of seal during the 18th century. 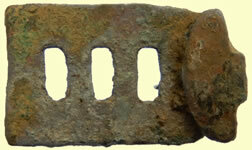 It was found to be more versatile than the rivet-type seals hitherto used on cloth, as it could be attached to a wider range of goods, including the bags, bales and sacks in which they were distributed. 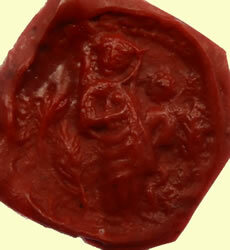 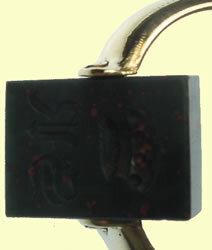 The method of sealing was to pass the ends of the package's tightened drawstring through the tunnel in the blank seal. 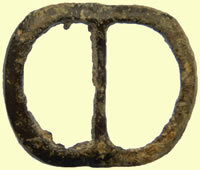 The latter was then die-stamped to impress the design and grip the string. 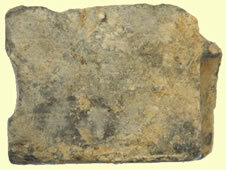 Peru was a major supplier of guano between the early 1840s and 1870s. 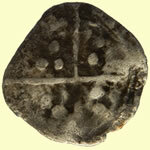 Medieval hammered silver long cross penny Unknown silver fragment - ring ? 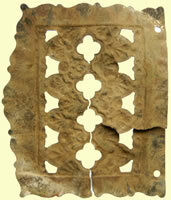 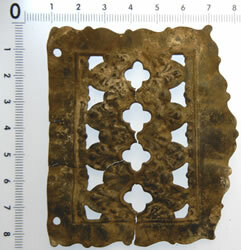 Huge 17thC fretwork book mount ? 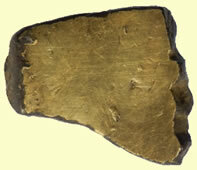 Org Danny just unrolled his Bronze Age disclaimed gold treasure find - it is 8 inches long and has holes in each end indicating an open ended wrist armlet. 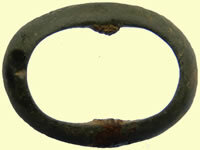 It would be great to have to fixed and returned to a typical wrist band like below. 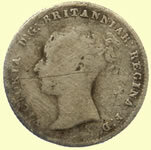 The regiment was raised in 1793 from the men of Connacht by John Thomas de Burgh, 13th Earl of Clanricard. 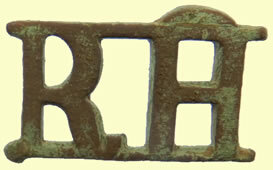 In 1881, the 88th (Connaught Rangers) Regiment of Foot (which formed the 1st Battalion) and the 94th Regiment of Foot (which formed the 2nd Battalion) were amalgamated. 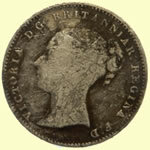 The amalgamation of the two regiments into one was part of the British Government's Childers Reforms of the British Armed Forces which was, in turn, a continuation of the Cardwell Reforms implemented in 1879. 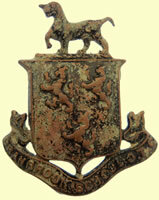 At that time five infantry battalions were given Irish territorial titles. 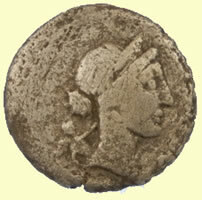 This one isn’t “Republican”, strictly speaking – it belongs to the vague, in-betweensy period typically called “Imperatorial”, but which is not all that well-defined in time. It ends, definitively, with the accession of Augustus to the Imperial throne in 27 B.C. – when, exactly, it starts depends on who you are asking, but this era contains the rules of Julius Caesar, Pompey, Marcus Antonius, The “Triumvirates”, etc. 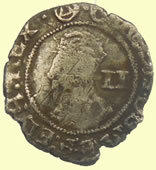 Crawford 468/1, Sydenham 1014; RSC Julius Caesar 13. 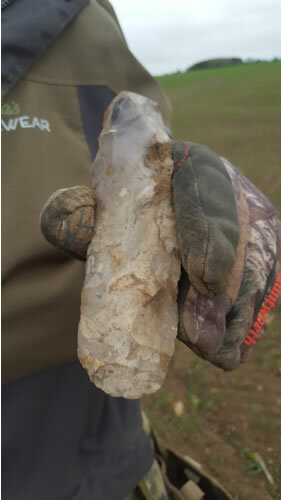 Nice find! 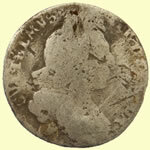 – that’s the second Caesar denarius your diggers have found recently in addition to all the Republican stuff – you must be on some late 1st century B.C. 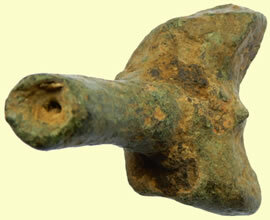 – or early 1st century AD (pre-invasion) site. 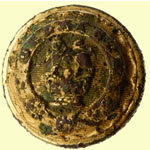 The 52nd (Oxfordshire) Regiment of Foot was a light infantry regiment of the British Army throughout much of the 18th and 19th centuries. 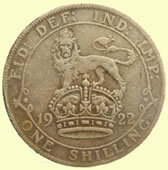 The regiment first saw active service during the American War of Independence, and were posted to India during the Anglo-Mysore Wars. 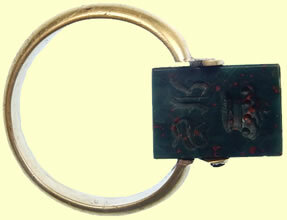 During the Napoleonic Wars, the 52nd were part of the Light Division, and were present at most of the major battles of the Peninsula campaign, becoming one of the most celebrated regiments, described by Sir William Napier as "a regiment never surpassed in arms since arms were first borne by men". 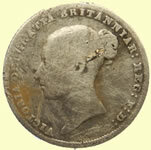 They had the largest British battalion at Waterloo, 1815, where they formed part of the final charge against Napoleon's Imperial Guard. 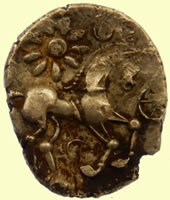 They were also involved in various campaigns in India. 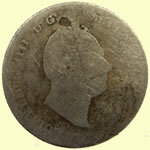 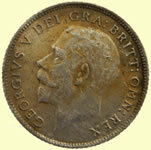 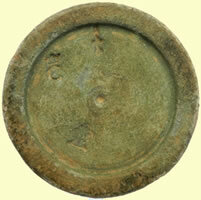 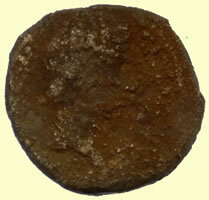 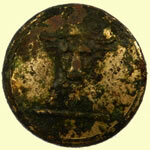 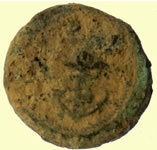 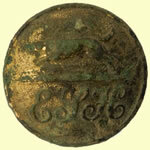 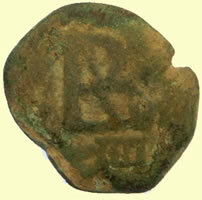 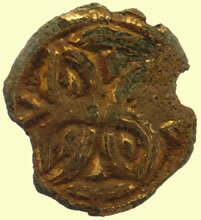 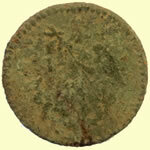 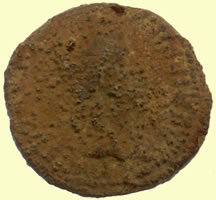 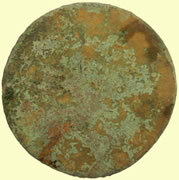 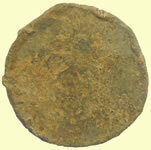 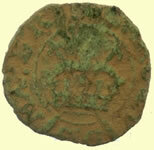 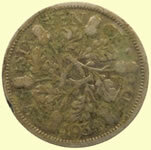 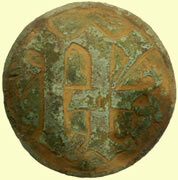 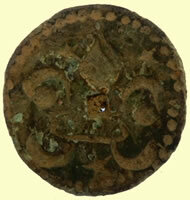 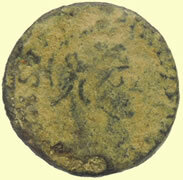 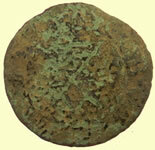 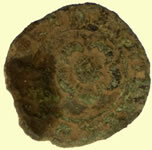 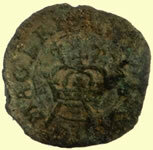 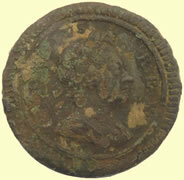 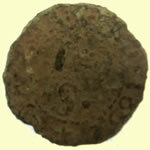 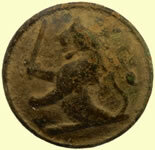 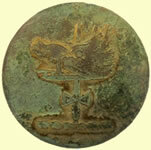 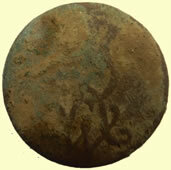 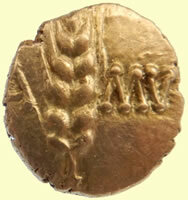 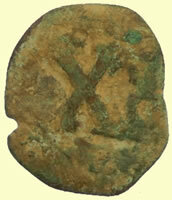 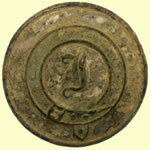 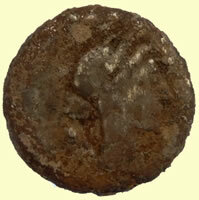 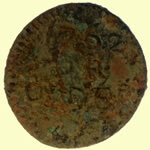 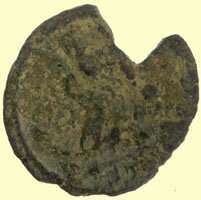 Interesting bronze coin - reminds me of the Maravedis revalidated type coin ? 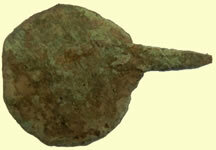 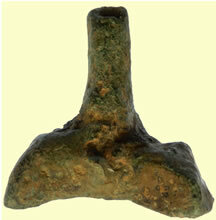 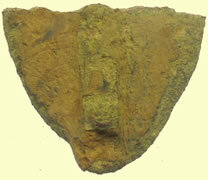 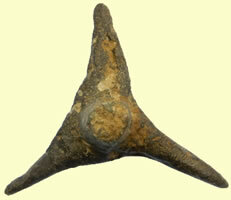 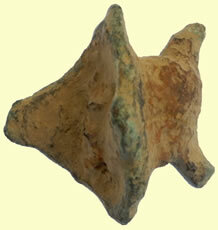 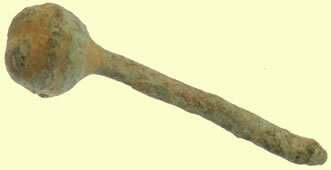 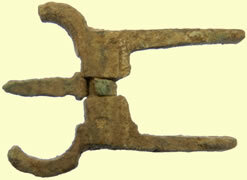 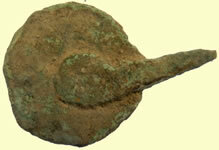 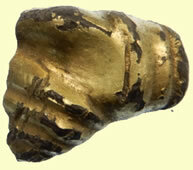 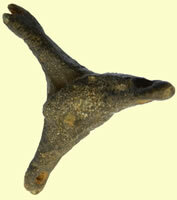 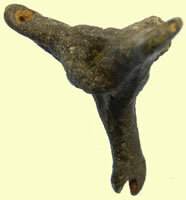 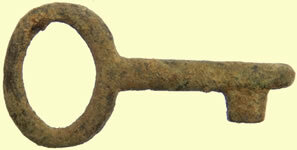 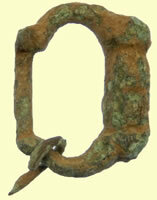 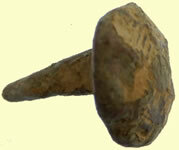 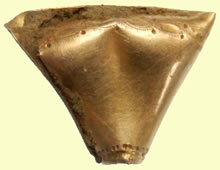 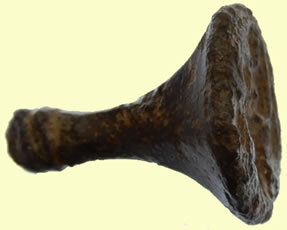 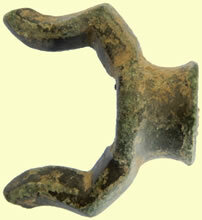 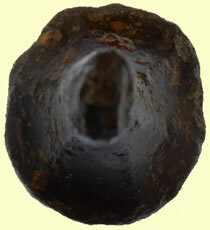 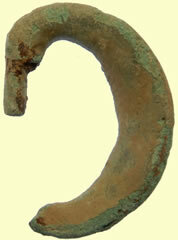 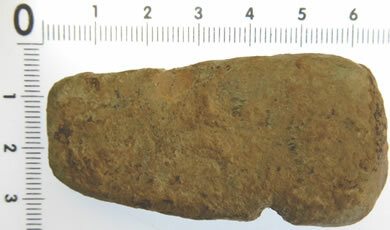 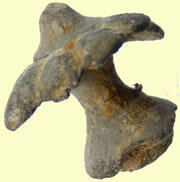 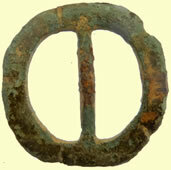 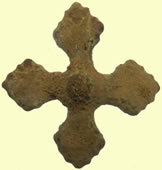 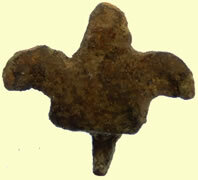 A copper alloy Roman prick spur probably dating to the fourth century AD. 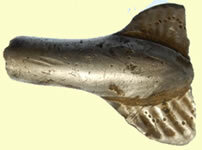 The spur is made up of three projecting arms with approximately 90 degrees between each arm. 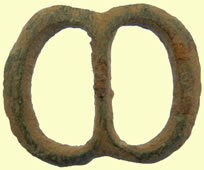 On two of the arms are small loops and a break suggesting one on the third arm. 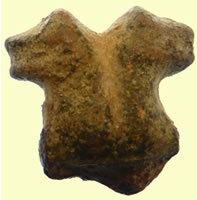 There is a hexagonal area in the centre of the three arms and this is where the spur is attached. 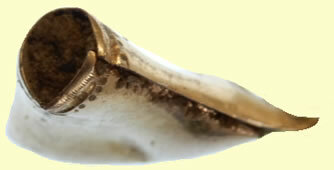 The spur is cone shaped. 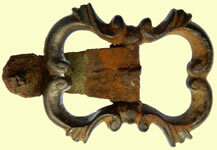 On each of the arms there is incised linear decoration. 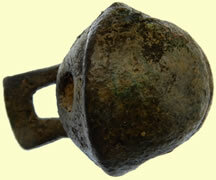 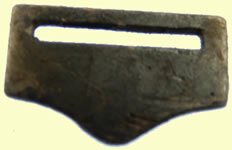 Spurs such as this example are thought to be of a British type and have been found in fourth and fifth century contexts. 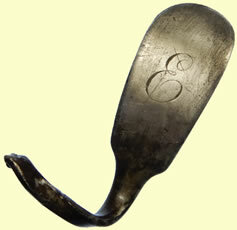 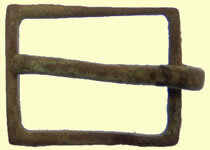 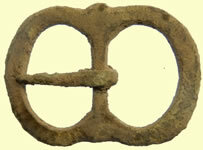 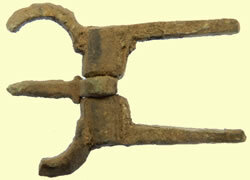 Although spurs are primarily military in character it is not unusual to find spurs of this type in rural locations. 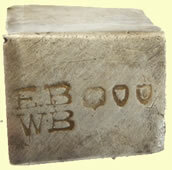 Similar examples have been recorded on the PAS database: DENO-8FB8E3 and LIN-D3B115.